Provide IOS based multi-protocol routing using a variety of routing protocols. Work with the PFC for implementing layer 3 switching & traditional router based input/output ACL's. Note, PFC can implement ACL's without requiring a MSFC. Provide other SW based features (like NAT, Policy Routing, Encryption etc) which are not supported in PFC hardware. Layer 2 MAC address lookups into the Layer 2 CAM table. Looking into the packet headers to determine if this switching operation will be a Layer 2 or a Layer 3 operation. If it is going to be a Layer 3 operation, then it will hand off the packet to the Layer 3 engine for further processing. Hardware based forwarding of IPv4, IPv6 and MPLS tagged packets. QoS mechanism for ACL classification, marking of packets, and policing (rate limiting). Security mechanism for validating ACL rules against incoming packets. Maintaining Adjacency entries and statistics. The PFC3 supports hardware based Layer 2 and Layer 3 switching, processing security and QoS ACLs in hardware and the collection of NetFlow statistics. There are five versions of the Policy Feature Card in use today. The PFC3A , PFC3B, and PFC3BXL are integrated into the Supervisor 720-3A, Supervisor 720-3B and Supervisor 720-3BXL respectively. The PFC3B is the only option for the Supervisor 32, while the PFC3C and PFC3CXL are integrated into the Supervisor 720-10G-3C and Supervisor 720-10G-3CXL. The Catalyst 6500 architecture supports the use of Distributed Forwarding Cards (DFC). Distributed Forwarding Card is a combo daughter card comprising a MSFC and PFC used by a fabric enabled Cat6500 linecard to perform distributed switching. DFCs are located in linecards, not in Supervisors. A DFC is used to hold a local copy of the forwarding tables (constructed by the MSFC) along with Security and QoS policies to facilitate local switching on the linecard. The DFC3A is available as an option on CEF256 and CEF720 based linecards. The DFC3B and DFC3BXL were introduced for linecards to operate with the Supervisor 720 equipped with PFC3B and PFC3BXL. The last generation of DFC, the DFC3C, is available as an option on the CEF720 based linecards but are integrated on the latest generation linecards, the WS-X6708 and WS-X6716. The primary MSFC3 will calculate, then push down a FIB table (Forwarding Information Base) giving the DFC3x its layer 3 forwarding tables. The MSFC3 will also push down a copy of the QoS policies so that they are also local to the line card. Subsequent to this, local switching decisions can reference the local copy of any QoS policies providing hardware QoS processing speeds and yielding higher levels of performance though distributed switching. Performance is the biggest and most obvious reason to implement DFCs. You move from a 30 Mpps centralized forwarding system anywhere up to a 400 Mpps distributed forwarding system. This forwarding performance is for all L2 bridging, L3 routing, ACLs, QoS, and Netflow features, i.e., not just L3. The performance benefit of a DFC is most applicable when you use the 67xx series modules. This is because these modules have enough ports and bandwidth to generate much more than the 30Mpps centralized forwarding engine has available. A 67xx-series module without a DFC is subject to the same centralized performance characteristics of all other centralized forwarding modules. DFC also minimize the impact that a classic module has in a system. Classic modules do affect the centralized forwarding performance of a system, limiting the maximum centralized forwarding rate to 15Mpps. Modules enabled with DFCs have their own forwarding engine and are not subject to this performance degradation. If a classic module used, the inclusion of a DFC mitigates any performance issues/concerns. Any non-DFC modules are still subject to the available 15 Mpps of forwarding available when a classic-module is present. Packet Forwarding is done on the ingress forwarding engine. Therefore, packets coming into the ports on the Sup720-3B will have forwarding done on the PFC3B of the Supervisor. Packets coming into ports of line cards with DFC3s will have the forwarding done on the DFC3. Packets coming into ports of line cards with CFCs will have the forwarding done on the PFC3B of the Supervisor. The MSFC3 only does forwarding in the cases where the PFC3 or DFC3 cannot make the forwarding decision. Some of these cases include when traffic has IP Options set, when ACLs are applied to an interface but the ACL is not programmed into the ACL TCAM for some reason, when packets have TTL expiration, when packets hit an ACE with the "log" keyword, and others. CFC is a centralized forwarding card for the switching modules which makes IPv4 Routing over the PFC. CFC does not do local forwarding, the forwarding is done by the PFC in the Supervisor. As the forwarding is centralized, the PFC performance, FIB entries, ACL lables are shared among the line cards that uses the Supervisor PFC for forwrding. 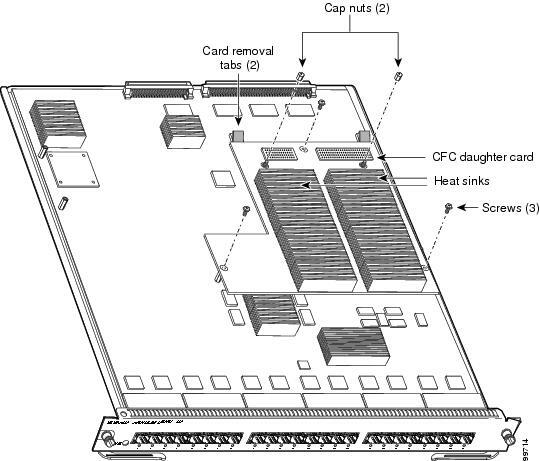 WS-F6700-CFC is the CFC card used on WS-X67xx Ethernet Modules. This daughter card is supported only by the Supervisor Engine 720. Note: CFC or the Centralized Forwarding Card was introduced along with the CEF720 modules. It provides centralized connectivity to the supervisor for look-ups and results. Though the switch fabric is used for the data, but the CFC is responsible to send a look-up request from the Supervisor and then get those results back.